You are here: Home » Services » Is an Air Quality Assessment Required? Emissions of dust and/or odour due to the operation of the proposed development. An air quality assessment may also be required where new exposure will be introduced into an area of poor air quality (including areas affected by dust and/or odour). 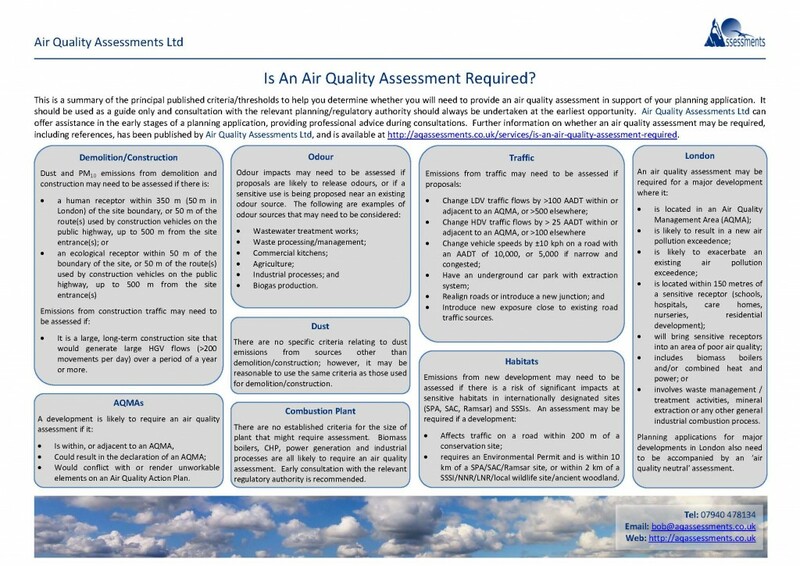 The principal published criteria/thresholds have been collated into a single document by Air Quality Assessments Ltd, which is available to download from the following link. You can also print out a handy summary chart to keep as a quick reference guide by clicking on the following link, or on the image below. Hang the chart up by your computer, or pass on to your colleagues for use when screening the likely air quality impacts of your development. These documents should be used as a guide only and consultation with the relevant planning or regulatory authority should always be undertaken at the earliest opportunity to establish the requirement for, and scope of, an air quality assessment. Air Quality Assessments Ltd can offer assistance in the early stages of a planning application, providing professional advice during consultations.